April | 2012 | what? bread? 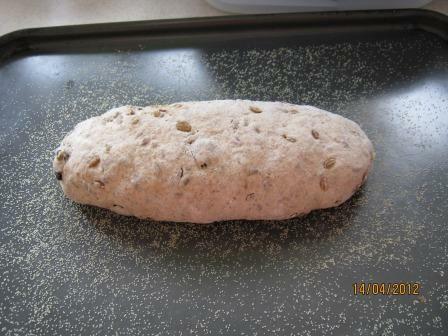 This is my third Mellow Bakers bake for April.From Dan Lepard’s The Handmade Loaf page 146. 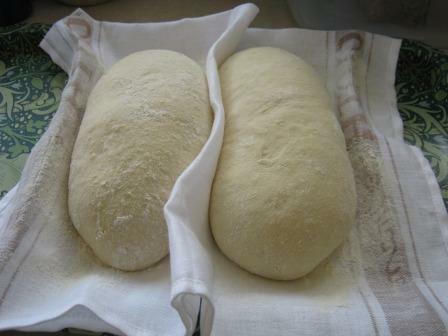 Ingredients are simply flour, salt, milk, yeast and butter. After last weekend’s excessive white bun creation I only made a half quantity, but I have to say right now I wish I’d made a whole one. Husband and child went out while I was baking and the buns had just finished a few minutes before they got back and they both came in saying “mmmm croissants”. Went down very nicely with a bit of last year’s raspberry jam. I would definitely do these again and now have more confidence about trying real croissants. 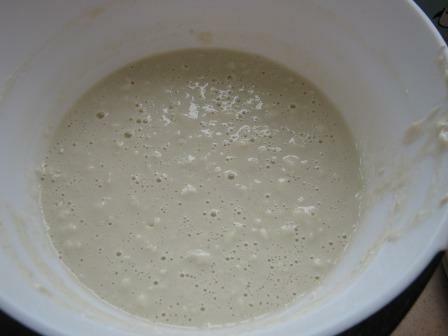 Sourdough with 3 flours – rye starter and then 50:50 extra strong wholemeal and strong white flours, and some salt. That’s it, no oil, no sugar, no yeast, no seeds, no absolutely anything artificial. As a part of learning how to do this I’ve also found my oven goes up to 275 C – dare I go that high? These were started at 260 and turned down to 200 after 10 minutes. Doing slow things quickly – what does that mean? 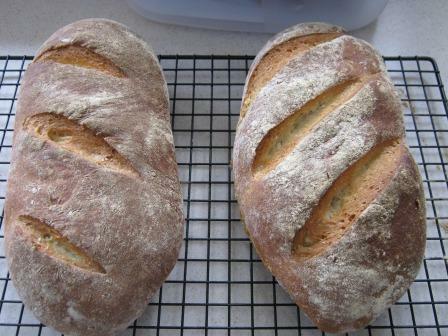 I’ve heard it said that people don’t make bread at home because they don’t have time. Having a breadmaker makes it easy because it does it all for you. What they are missing is the hands-on feel of mixing, kneading, smelling, judging, flouring, slashing, and finally baking. Something I have found with trying sourdough is that because it is really slow, it is paradoxically really quick and easy because the amount of baker intervention is small and spread out. With yeasted breads they have to be watched reasonably carefully to make sure they don’t rise too quickly and the cook books give periods of time like an hour, or an hour and a half, things you need to measure. Sourdough is happy to fit in around the baker. 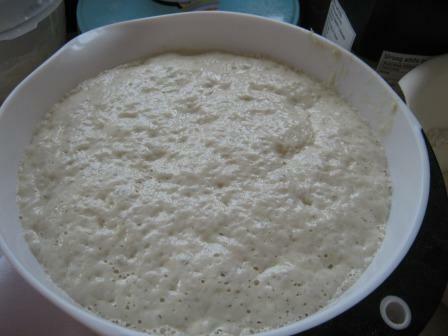 For instance, with the River Cottage approach I have been using I add starter to flour and water and leave it ‘overnight’, or in my case, ‘about six hours while I’m at work’, then it needs mixing with more flour and some salt and kneading for about 10 minutes. I do that stage when I get home before going to do the school run. Then it is left for an hour, and then worked into a ball. So I do that when I get back from the school run – but with no rush. 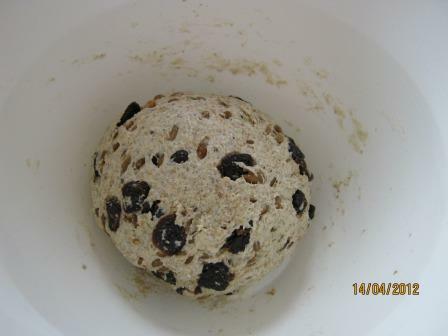 Then it is rested and worked into a ball again – up to four times in total – you decide! 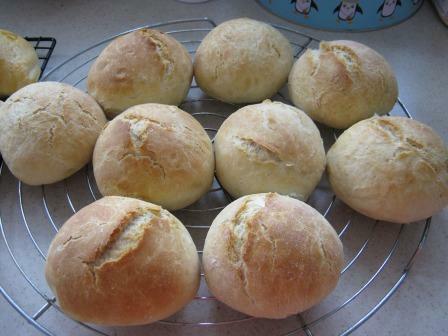 I decided on one more ball stage while I made and ate dinner and then worked into three loaves and left it to rise. Again, you have to wait for the dough, so the book says 1 to 4 hours. For me last night it was about three hours and in that time I went swimming and put Adam to bed, see no worries about the bread. 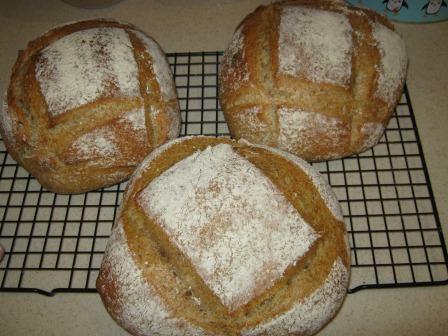 Then finally when everything was quite I could bake the bread and it’s done and dusted and ready for the morning. My second Mellow Baker’s loaf from Dan Lepard’s The Handmade Loaf – page 106 since you ask. 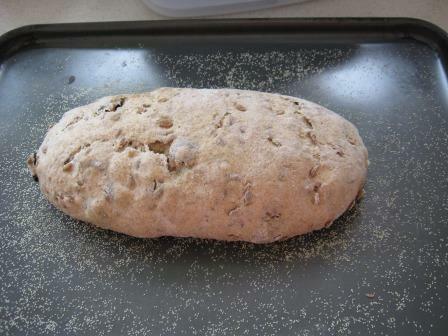 strong white flour, fine rye flour (didn’t have this so just sieved a bit of regular rye flour), salt, fennel seads, rye leaven, water, fresh yeast, dried cherries, cooked and soaked rye grains and white poppy seeds for dusting on the top (didn’t have them so used some golden linseeds). 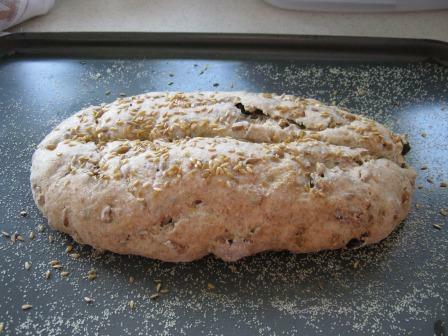 The recipe is reasonably easy to follow but you have to start the day before to cook and soak the rye grains. Rye grains aren’t the easiest of thing to buy but I managed to find some in London yesterday, in an emporium where they charge £2.49 for a small sourdough loaf. 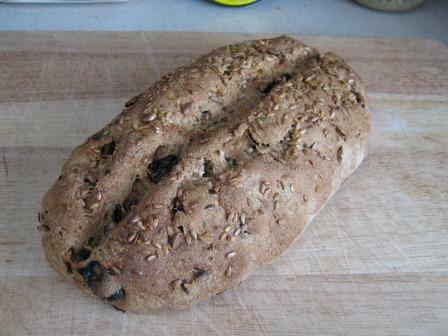 The rye grains were only £1.39 and 500g will go a long way. 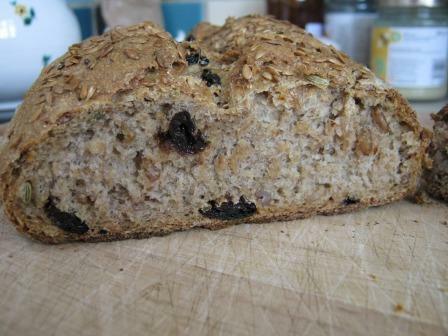 Dried cherries are the most expensive ingredient in this loaf and I think as such might be the restricting element to making it again, so I might practise with raisins until it improves. So pictures of what happened are down below. 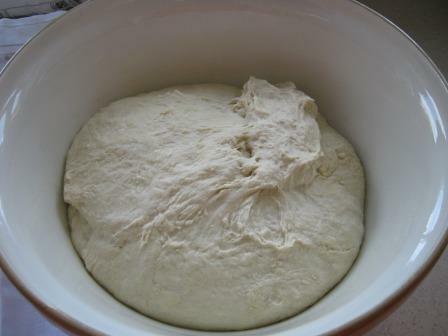 The dough was never soft as described in the recipe, being quite hard and resistant, and also cold to the touch. I did put it in the oven with the ‘dough rising’ setting on for a few minutes to raise the temperature while it rested for the first hour, but not enough to heat the dough. It was left to rise on the baking tray for longer than the recipe said, but I don’t think that’s inhibited it in any way. 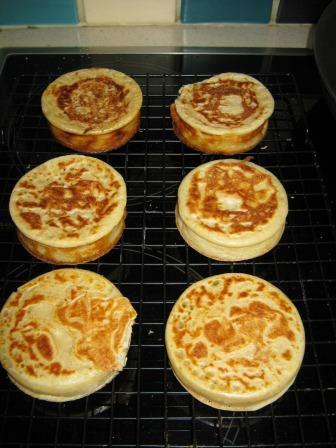 Crumpets are another flour based item that I think have risen in price beyond what is reasonable for what they are. 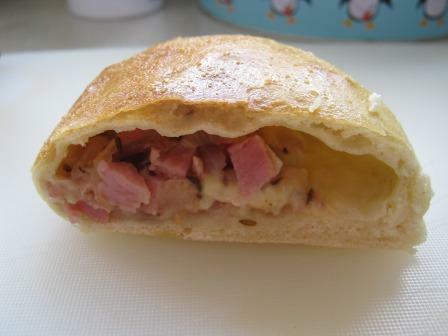 The River Cottage bread book contains a recipe for them, so I thought I’d get some crumpet rings and give them a go. 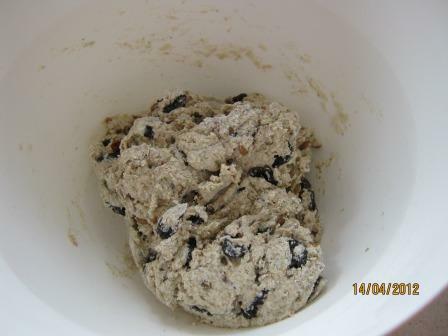 225g plain white flour, 175ml warm milk, 175 ml warm water, half teaspoon fresh yeast, 5g salt, half teaspoon of baking powder. 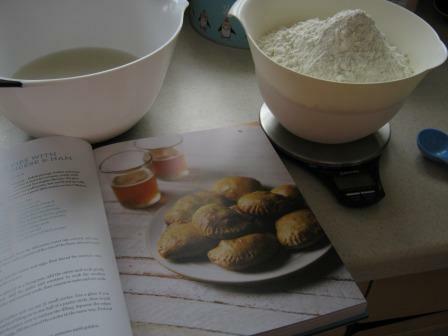 The recipe said not to add the salt and baking powder to the dried things, but by the time I had read that it was too late! In the last few I put a little less batter and they aren’t too thick. In all I made 7, but I think that quantity could do 8. 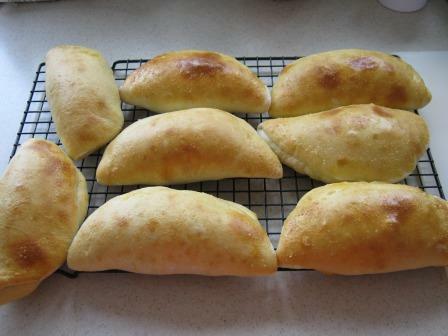 Here are the last 6, the first one was eaten hot while I was doing the others. Well it has been hailing here today like a winter’s day, so what better than winter food? 200g strong white flour, 200g wholemeal four, 100g or thereabouts of both starters, 225ml water and 1 and half teaspoons of salt. 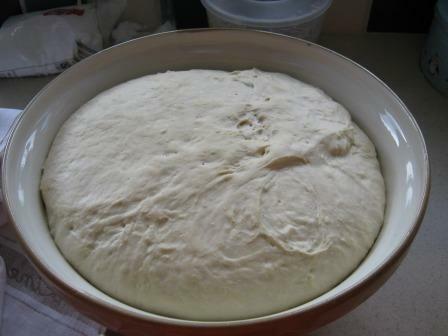 And I left it to rise twice before shaping, mostly because I changed my mind about going out and just had to go out for a couple of hours. So, it was kneaded for 10 seconds, left to rise for about an hour and a half, kneaded again and left to rise for another hour or so, then shaped and left while we were out for almost two hours and then baked when we got back. 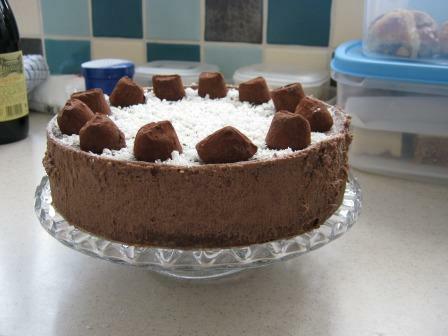 Now just marking time until my new Dan Lepard book arrives and I can start joining in with the Mellow Bakers. I have also ordered some crumpet rings and hope that will make another story too.